Pelli Clarke Pelli Architects selected following an international competition. Pelli Clarke Pelli Architects used a video prepared by Geomatrix Productions to help visualize its architectural concepts as part of an international design competition in Hanoi. After their submission was selected as the winning proposal, Pelli Clarke Pelli designer Nina Liu reported that the video looked great on the big screen. “Re-rendering to a higher resolution really paid off,” she said. 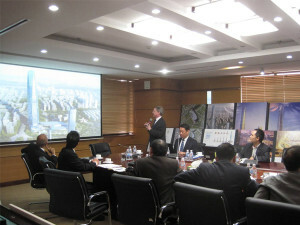 According to Geomatrix producer Patrick Volk, “the video project ran the gamut from very global to very local.” Animated 3-D architectural renderings produced in China were downloaded and incorporated into the program moments after they were approved by Pelli Clarke Pelli architects; revisions were uploaded by Geomatrix Productions for review and ultimately high resolution video files were delivered by hand to meet the tight deadlines involved. Close collaboration was key, while actual “facetime” was at a minimum. Pelli Clarke Pelli Architects will design a new headquarters for Vietnam’s national oil and gas company, creating a landmark development in Hanoi. The development will encompass a 79-story office/hotel tower, a podium to include a petroleum museum and media center, shops and a skating rink; and a 47 story apartment tower.